Healthy Children Project, Inc., Inc.
As the evidence of the benefits of breastfeeding and the risks of not breastfeeding mounts, improving breastfeeding rates has become an increasingly important public health strategy for promoting optimal health among mothers and their babies (American Public Health Association, 2007; U.S. Department of Health and Human Services, 2005; Obama, 2010). The practice of placing newborns skin-to-skin within minutes of birth and remaining there uninterrupted through the first breastfeeding has been shown to increase the rate of exclusive breastfeeding when mothers and babies are discharged from the hospital. Placing newborns skin-to skin with the mother immediately after birth and encouraging them to support the infant to breastfeed when ready has become the standard of care described in the World Health Organization/UNICEF Baby Friendly Hospital Initiative (continued in current revision in 2018). Advances in knowledge and skill regarding labor and birth allow most mothers to safely experience the birth of their baby awake and aware. The stages of labor are well known and well documented. 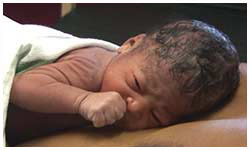 The process of cesarean surgery has become routine. Recent research has helped us understand that being in skin-to-skin contact with the mother during the first hour after birth is a critical component in providing behaviorally-appropriate individualized baby-adapted care for the full-term newborn. 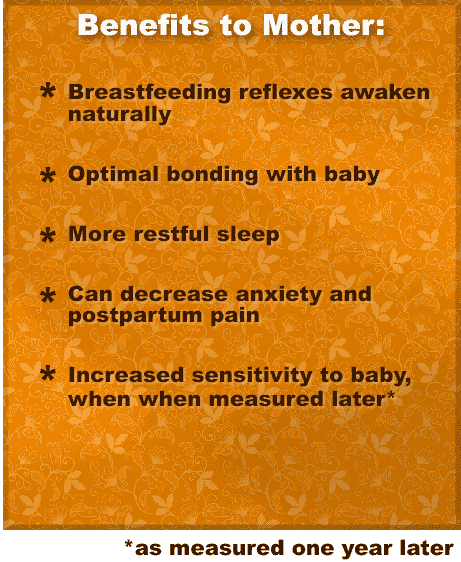 Why is continuous, uninterrupted, skin-to-skin contact beginning immediately after birth important to the baby? 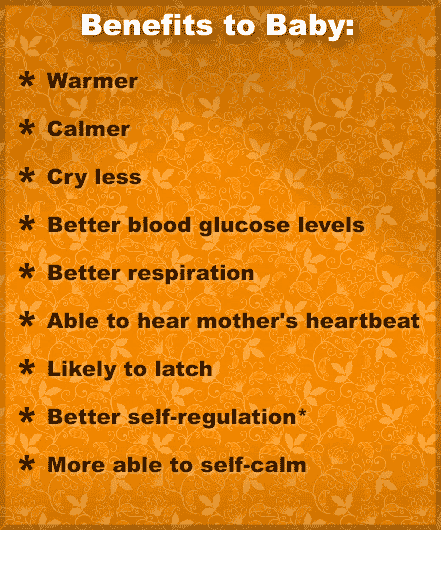 This is a developmentally-distinct time for the baby and there are well documented short and long term physical and psychological advantages when the baby is held skin-to-skin during this time. Healthy Children provides a number of resources to help assist staff with implementing skin-to-skin in the first hour. The video Skin-to-Skin in the First Hour After Birth: Practical Advice for Staff after Vaginal and Cesarean Birth is an excellent source of support for staff. The Magical Hour: Holding Your Baby SKin-to-Skin in the First Hour After Birth is perfect for parents, providing them a realistic view of what it means to spend that first hour in direct uninterrupted contact with their baby. In addition, we offer consulting services using the PRECESS method, working side by side with staff to make appropriate changes that may be unique to the hospital's situation. Our experts also are available for Keynote speeches. Call or email for more information.